At Cobo Center, we believe that an informed exhibitor is a successful exhibitor. Below is a list of commonly asked questions and their answers. We are confident you will find Cobo to be the most user-friendly convention center in the nation. Cobo Center is located in downtown Detroit at the Corner of Washington Blvd. and East Jefferson. Please click here for map/directions. Does Cobo Center have retail shopping? Cobo Center proudly partners with the Detroit Shoppe, a non-profit agency that showcases the people, places and products that have shaped Detroit. 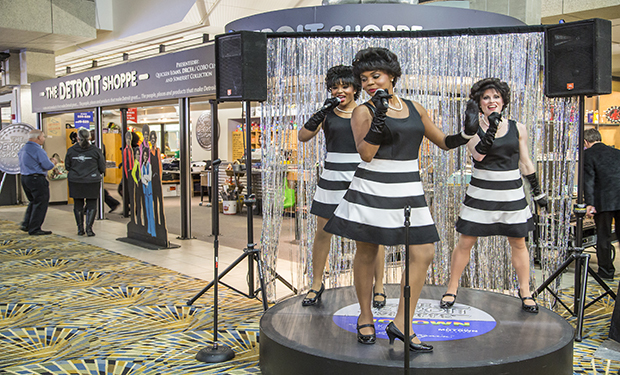 Every penny of every dollar earned from the sale of products in the Detroit Shoppe, located on the Cobo Center concourse, goes to support local charities and cultural institutions. Visitors from all over the world enjoy the made-in-Detroit merchandise, and are encouraged to take it home and share with loved ones, to continue the ongoing legacy of Detroit. How far is the airport from the center? Is Detroit safe for my event and attendees? Cobo Center is an established lighthouse facility in downtown Detroit and Cobo Security fully collaborates with Project Lighthouse. The Downtown Detroit Partnership, with its ongoing efforts to provide safety, lighting and code enforcement, and Project Lighthouse, a private public collaboration of business and public safety departments, has created a security force in downtown Detroit that is unique in the nation and equal to none. The Downtown Detroit Partnership is a private/public partnership of corporate and civic leaders that supports, advocates and develops programs and initiatives that create a clean, vibrant, safe, beautiful, inviting and economically strong Downtown Detroit community. The public partners are the City of Detroit and the Detroit Economic Growth Corporation. Their Safety, Lighting and Code Enforcement program supports an environment that provides residents, workers and visitors personal safety with: a uniformed presence on downtown streets; an improved perception and realization of public order created by clean streets and sidewalks, well-maintained landscaping, public spaces and streetscape elements; good lighting; elimination of blight using tools such as stringent code enforcement. Is there parking available at the Center? Yes, there are 2246 parking spaces attached to Cobo Center: 1250 at the Roof Deck, and 406 in the Cobo Center Congress St. Garage and 640 in the Washington Blvd. Garage. Hours of operation for Cobo Center parking garages may vary depending upon the event needs. Cobo Center is not responsible for items left in cars parked in the Cobo Center garages. What hotels are close to Cobo Center? Majority of rooms in downtown convention hotel block less than 5 years old – over 1,850 new, competitively priced rooms on line since 2007. A list of dowtown Detroit hotels is listed in the Discover Detroit "Accommodatons" page of this website. Does the Convention Center have Wi -Fi? Yes, Cobo Center has free, ultra high speed Wi-Fi available throughout the facility for use. WiFi saturation is a problem for all big events and can make WiFi connectivity unreliable. If portions of your event are relying upon Internet, we highly recommend you order a hard wire connection for uninterrupted connectivity. Does Cobo Center require that I carry insurance for my event? Yes. A $1 million bodily injury and property damage combined insurance policy must be in effect and proof submitted 10 days before the start of any operations in Cobo Center. All policies shall contain an endorsement providing for furnishing Cobo 10 days written notice of termination of insurance for any cause. The Detroit Regional Convention Facility Authority and SMG shall be named as additional insured on the policy and insurance certificate. Cobo Center reserves the right to require that events provide additional insurance if deemed advisable due to special circumstances. Certain events may require additional insurance rates. Do you rent wheel chairs? Complimentary non-motorized wheel chairs are available for use on first come first serve basis. Please visit our Information desk located in the main concourse/lobby. How do I arrange for Food Service at the Center? All food and beverage services at Cobo Center are provided by our exclusive food service partner – Centerplate. You may contact them at 313-567-3880. How do I arrange for electrical services in my booth/ meeting rooms? Electrical Services in booths is provided exclusively by Cobo Center. You may reach us at 313-877-8777. You may access the order form online at www.cobocenter.com. In meeting rooms you may plug into limited power available through the wall outlets at no additional cost. Additional power may be requested. How do I arrange for Vacuum Services in my booth? Vacuum services are available exclusivly through Cobo Center. You may us 313-877-8777. You may access the order form online at www.cobocenter.com in the Exhibitors section. If you bring your own vacuum cleaner, you may vacuum your own booth. Can I bring in my exhibit material myself without using union services? Yes. You may transport your own materials from the front exhibit hall doors, or from the designated POV (privately owned vehicle) loading dock, using a two-wheel cart. Where can I park my car to load/unload my exhibit materials? You may park your car at the Cobo Rooftop Parking or Cobo Center Congress Street Garage and bring your materials in using the front door of the exhibit halls. Parking is not available in front of the center for such activities. Tell me about the trade unions that work at Cobo Center. Cobo Center has a well-qualified, trained union staff available. Teamsters/Iron Workers: Perform material handling of freight, rental furniture etc. Electricians: handle electrical work which includes supplying power to the booth, making connections when hard wiring and/or harnesses are required and installing static lighting that is not built-in, integral part of the exhibit booth. Stagehands shall do stage and lighting set up , but not limited to, press events, shows and theatrical style events. This shall include theatrical rigging, cued lighting, theatrical lighting, video lighting, projection, audio, electronic show equipment (i.e. audio, cameras, switches etc.) and props and scenery. What can I do in my booth without using union workers? As an exhibitor you have a great latitude to perform your own work in a booth up to 400 square feet (except island booths) using a 3 step ladder and cordless hand tools. See the Event Planning Guide for more details. Can I ship my booth and materials directly to the Convention Center? Yes, you may ship directly to the convention center provided prior arrangements have been made with your Show Appointed Contractor. Please check the exhibitor manual provided to you by your show/event management for more details. When shipping your materials, the shipment must be scheduled to arrive during the dates specified in your exhibitor kit and address must include the name of the show, name of your company and the booth number. Do you have a Business Center located in the Center? Yes. Our business center is located in the main concourse/lobby near the front entrance to the center. These services can be ordered for events through your event manager. Some the services provided include: copy, fax, access to computer, small freight shipment, visitor information etc. Hours of operation may vary depending upon event needs. Do you have policy on advertising within the building? Event advertising placements are available on the Cobo Center video board system that includes two external media mesh signs, the concourse video board over the business center and the video board sign system placed throughout the food court, Grand Riverview Ballroom, atrium and meeting rooms. Refer the the "Meeting Planner Tools" section of the website for more information. Event banners can be displayed on the outside of Cobo Center for a fee and with Center approval. Advertising is limited within the rented exhibit space or meeting rooms. For details on the rules concerning signs and banner placement consult the Cobo Center Event Planning Guide and your event manager. Who provides security to my rented space? In most of the meeting rooms the key system can be changed to a limited access keys at a per room nominal fee. In exhibit halls and concourse, if used for registration etc., please use the services of a private security firm. Consult your Event Coordinator for a list of security providers.